After the purge in Saudi Arabia, what next for oil prices? The 5 accused of relying on “fake news”… the bait-and-switch of “tax reform”… winning big off tax-plan maneuvering…and more! Seems like only yesterday we reported bitcoin had broken through another barrier — the $6,000 mark. 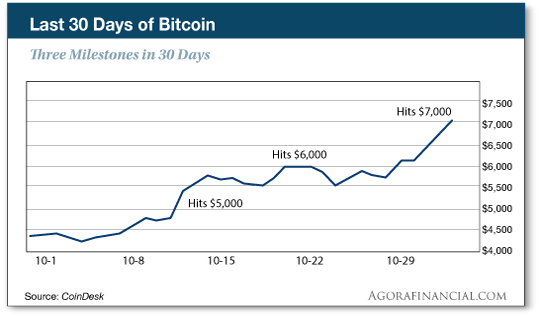 In the past 30 days, bitcoin jumped three hurdles: $5,000, $6,000 and now $7,000. As of today, bitcoin’s price is $7,058.66. The steady march of bitcoin — up and to the right — can be attributed to a couple announcements from established financial institutions waking up to crypto’s potential. As noted here in real-time last Tuesday, CME Group — parent firm of the world’s biggest options and futures exchanges — announced it will launch bitcoin futures by the end of the year. The Chicago Board Options Exchange made a similar announcement back in August. Then startup group LedgerX, a competitor to CME and CBOE, let slip it had already traded bitcoin options on its platform. Our James Altucher says, “Because digital currencies are decentralized, their success does not depend on the interest of and participation by banks. Now Coinbase reports it will make cryptocurrencies easier — and faster — to trade. Coinbase is turning out this function to customers in the U.S. and will extend the platform internationally in the months ahead. At the end of the day, these developments — acceptance from established institutions and streamlined crypto trading — further signal bitcoin’s not going anywhere. [Ed. note: In response to popular demand, James has opened up a new session of his Cryptocurrency Masterclass. During the first round, tens of thousands of people got access to his exclusive cryptocurrency script — the very formula he used to make $1.8 million on a single crypto trade. The bump up in oil prices thanks to the turmoil in Saudi Arabia “is likely to prove short-lived,” in the estimation of Chas Freeman. A barrel of West Texas Intermediate is holding above $57 this morning — $2 more than it was before a flurry of events in Saudi Arabia over the weekend, documented here yesterday. It’s true that “MBS,” as he’s known, is ginning up conflict with Saudi Arabia’s archenemy Iran… but only in places where there’s no meaningful oil production. There’s Yemen, where MBS accuses Iran of “direct military aggression” by supplying a missile to Yemen’s Houthi rebels that was intercepted over the Saudi capital, Riyadh. (Never mind that the Burquan 2H missile is the kind that was in Yemen’s arsenal for years before the Houthis got control of it.) But Yemen has no meaningful energy reserves. Ditto for Lebanon, where MBS appears determined to stir up some sort of conflict with Hezbollah — the Iranian-allied faction that’s currently part of Lebanon’s governing coalition. You’ll find mainstream fretting about the possibility of outright war between Saudi Arabia and Iran, both of which have plenty of oil… but right now that seems overblown. More likely MBS wants the United States to attack Iran for him; it’s the old joke about “Let’s you and him fight.” And on that score we can’t discount the possibility; MBS apparently bonded recently with the president’s son-in-law and Middle East “adviser” Jared Kushner. Greg’s on a business trip to Vegas (really, there’s a conference going on) and taking in the scene on the Strip and beyond. He’s seen glitzy pot dispensaries with people lined up outside the storefronts… even at 9 o’clock in the morning. And those lining up for legal pot represent a panorama of humanity — men in business suits, middle-aged vacationers and “geezers and grandmas” (Greg’s words). The overrun pot dispensaries point to changing attitudes toward the use of marijuana — and not just in Las Vegas. A Gallup poll mentioned in The 5 last month reveals 64% of Americans favor pot legalization; that’s up from only 12% back in 1969, when the annual poll started. Now a couple alcohol distributors are catching the wave of cannabis’ popularity. Alcohol distributors aren’t the only ones exploring the impact of legal marijuana. Eight states have already legalized recreational marijuana… and other states will follow. It is not too late to take a flier on penny pot stocks; if you missed out on the first wave, our cannabusiness pro Ray Blanco spells out your second chance right here. Ain’t nothing like the real thing, baby… as a jeweler in Ottawa recently discovered. 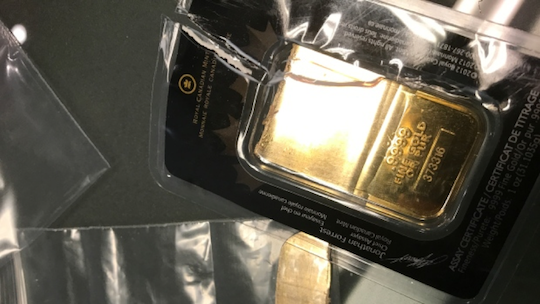 He bought a one-ounce gold bar from a branch of the Royal Bank of Canada that turned out to be a counterfeit… even though the bar and its package were marked with the insignia of the Royal Canadian Mint (RCM). The RCM says it “did not manufacture, ship or sell the above-mentioned product” and hoped the report of fake gold wouldn’t raise speculation about the purity of the mint’s gold inventory. “Counterfeiting of Royal Canadian Mint products is extremely rare and this is an isolated case,” they said in a statement. But a quick search of the internet proves otherwise. Wish.com, an online retailer of unknown provenance, offers a “Canadian Gold Bar 1 OZ. .9999 Premium Gold” bearing the RCM’s stamp. The cost? Thirteen dollars plus shipping and handling. Brian Bosse, an analyst with Toronto-based Murenbeeld & Co. that forecasts the price of gold, says, “This is not a one-off. Nobody does this once.” Bosse says most buyers wouldn’t think twice about the authenticity of gold purchased from a bank. “But that concept is now under attack if there’s more than one of these out there.” And if there’s more counterfeit gold in circulation, Bosse notes this might cast a shadow over the gold market. After our description of the House Republican tax plan as a “pig in a poke” yesterday, we heard from one of our regulars. “Dave, it sure is! Is it just me, or does their so-called tax plan reek of a cattle call for lobbyists to line up and start doing their thing? “There are so many moving parts here, it’s hard to keep track of them: the corporate tax breaks, the vanishing individual credits/deductibles, the ‘chained CPI’ ruse and my personal favorite — this notion that we’ll be able to file our income taxes with a postcard. “This is not a coherent plan. It seems more like an invitation for Corporate America’s finest to persuade our congressional ‘leaders’ to load the sausage machine with yet another boatload of pork. The 5: Yes. Assuming it even passes. And if it does pass, it will later turn out to be a bait-and-switch, just like the Reagan-Rostenkowski tax “reform” of 1986. Back then, we got lower rates in exchange for an end to certain deductions, exemptions and credits. Sound familiar? A boatload of such “loopholes” went bye-bye. Remember when credit card interest was deductible? But in exchange, the top tax rate fell from 50% in 1986 to 28% by 1988. It was a bait-and-switch because that 28% top rate lasted all of three years. Poppy Bush and his lyin’ lips brought the top rate up to 31% in 1991 and Bubba raised it to 39.6% in 1993. The deductions that went away under the 1986 law? Those never came back. As for the postcard boast… does that even resonate with the public in this day and age of tax software and electronic filing? “I’m disappointed to see you get some of your information via fake news CNN,” a reader writes after Friday’s episode. The 5: This is an odd complaint to make, considering that a search of The 5’s inbox reveals you’ve been writing us periodically for the last seven years. You know we’re not an echo chamber for anyone. C’mon, everybody’s got an agenda. Some sources are more transparent about it than others, and CNN is less transparent than most… but it’s up to each of us to exercise our powers of discrimination. P.S. No matter what happens with the GOP tax plan, or when… there’s one thing you can do in the next two weeks to win big off all the maneuvering in Washington. Details here.